Mottled granite round top 100 cm round with wrought iron legs. 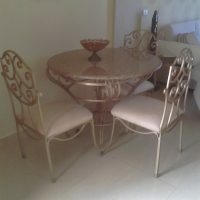 4 chairs in wrought iron with beige seat covers. Very heavy and sturdy, can be used inside or outside in garden or terrace. Can be viewed in Hadaba.